Last week Nissan began production of the first UK-built electric car, the Leaf, at its plant in Sunderland. The company believes that after a slow start, the time has finally come for the battery operated electric car. 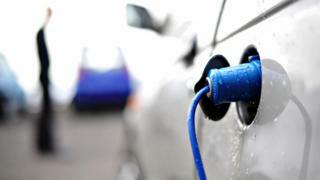 Electric vehicles are seen by governments as an important part of cutting emissions and reducing global warming. After all, what comes out of the car is completely clean, but nonetheless some scientists are questioning their green credentials. How the electricity which powers them is generated. One recent study by scientists in EV-friendly Norway has found that in some circumstances electric cars can have a greater impact on global warming than conventional cars. One of the authors of the report, at the Norwegian University of Science and Technology, Guillaume Majeau-Bettez, admits that he is shocked and disappointed that their findings are not more positive for EVs. "The electric car has great potential for improvement, but ultimately what will make it a success or failure from an environmental standpoint is how much we can clean up our electricity grid - both for the electricity you use when you drive your car, and for the electricity used for producing the car." The study is a life cycle analysis of the global warming impact of the production and operation of EVs, driven for 150,000km (93,750 miles), compared with the production and operation of conventional cars. The scientists include so-called "well to wheel" data, taking into account the energy needed to refine and transport oil into petrol or diesel. One of the findings is that the energy intensive manufacturing of EVs mean that some cars make almost double the impact on global warming as conventional cars. This is mostly because of the raw materials and energy needed to build the lithium-ion batteries. However, the moment a new EV hits the road, the environmental picture starts to improve. However, even here the picture is mixed, and wholly dependent on how electricity is generated in the country the car is being driven in. It can even depend on what time of day the batteries are charged because night-time electricity is less dependent on coal. In the UK, during 2012, electricity generation from coal-fired power stations actually increased to almost 40% of total production, as the price of gas soared, and gas-fired electricity generation was reduced. Majeau-Bettez explains it thus: "For a European average power generation mix, and if you use your car for 150,000km, you could hope for a 25% improvement [in global warming impact] relative to a gasoline car. It seems that the UK has a more intensive coal and natural gas mix so the benefits would be somewhat less than that." The authors do not analyse individual countries, but Majeau-Bettez estimates that the global warming impact of an EV car driven in the UK is about 10% better over its life cycle than that of a car with an internal combustion engine. This picture should improve as the UK reduces its dependency on coal. According to the Department for Energy and Climate Change, by 2020 it is estimated that coal will provide only 11% of electricity. However, projections remain unclear because of rising gas prices and uncertainty over a new generation of nuclear power stations. Nissan, which has invested £420m in Sunderland to build a new version of the Leaf, is confident that the argument will swing in favour of electric vehicles. "We talk about ordinary combustion engine vehicles in terms of tail-pipe emissions," says John Martin, head of European manufacturing, "and if we compare tail-pipe emissions from an EV; they are zero. They're 100% less than an internal combustion engine car." "But on electricity generation you are right - 40% of the electricity generated in the UK uses coal. But the fact is that we know that mix is changing as we phase out coal-fired power stations and replace them with gas. And if everything goes to plan we'll be increasing the nuclear mix as well." It is also hoped that as EVs become less niche - just 2,237 were registered in the UK last year, a mere 0.1% of total car sales - greater volume production will make the manufacturing process more efficient. It all makes the choice for consumers of whether to switch to an EV a difficult and complicated one. Aside from questions about their driving range, and whether you will get to your destination without having to charge the battery, the environmental benefits are not always clear. And some research also has to be scrutinised carefully because oil companies are accused of funding pseudo-scientific reports aimed at doing down the EV market. The Norwegian study has been criticised by some, for example, because of links between the university and the oil company Statoil. However, the team behind the research insist that no oil money was used to fund their research. They have also published all their data online for public scrutiny. "We want people to make choices with their eyes open, knowing the trade-offs," says Majeau-Bettez. "There have been rather a high number of misrepresentations from all sides in this debate. There is no such thing as a zero-emission anything, whether a zero-emission vehicle or a zero-emission building. "Everything has emissions, but sometimes they are just further away from the user."